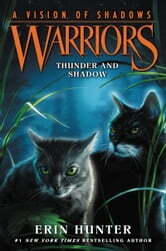 This is a great clan cats story exciting and surprising. Two sisters find themselves pulled in different directions and the future is unknowable. I am LOVING the new seris though i dont like that shadow clan got taken over and needletail joined rouges. I think rain sould end up likng someone else and needletail gets realy sad and runs away and violet follows, they tell the other clans the rouged weakness and they go t fight but the first shsdowclan cats ight he rouges!!! I need the next book. The Erin's are great at thinking up new and interesting ideas for their books. You have to get this book and the other books.